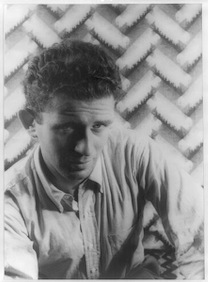 Norman Mailer: a young literary lion and a lion in winter. Note to readers: The nation's TV critics had but one brush with the late Norman Mailer. That was in July, 2000, when he materialized in Pasadena's Huntington Ritz-Carlton in connection with an upcoming American Masters profile on PBS. It was just before the quadrennial national political conventions, and Mailer for the first time couldn't muster an interest in them. He sure was entertaining, though. And his comments resonate in this very political year. 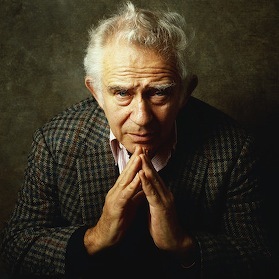 PASADENA, Calif. -- The great state of Norman Mailer passes. For the first time in 40 years, the literary world's foremost chronicler of national political conventions has decided they're not worth his attendance. He'll be in Europe when the Republicans meet in Philadelphia next week and the Democrats in Los Angeles two weeks hence. "I could be dead wrong," he said in an interview. "It could be these conventions end up full of surprises, but I truly doubt that. I really don't have a great deal of interest in how they turn out, because they're hardly going to affect the election unless something extraordinary occurs." Mailer, 77, uses two canes to get around these days. But he's still agile of mind and will be the subject of an American Masters tribute on PBS this fall. His most famous convention prose, Miami and the Siege of Chicago, gave readers indelible views of the 1968 party gatherings in those cities. He retains an avid interest in politics, even if the current presidential contenders fail to inspire him. Who'd he like to see running the country? "Warren Beatty," Mailer said, laughing. But he said he'll probably end up voting for Ralph Nader. The presumptive Democratic nominee, Vice President Al Gore, "suffers from an odd psychic resemblance to Richard Nixon," Mailer contended. "Their politics have nothing in common, but people always used to dislike Nixon because whenever an idea would come into his head, he'd run it through his mental sensor and it would come out the other end altered. "Gore is the same way. People just feel that the man is brainwashing himself with every remark. And that's a terrible liability. If he doesn't overcome it, I think he's going to lose the election. People like a man who will take a chance when he opens his mouth. (George W.) Bush does that a little more." Mailer said he'd be inclined to view Bush as an "empty suit" were it not for his mother, Barbara. Her he likes. "She's got a lot on the ball," he said. "She is not an empty vessel. Generally it tends to carry over to the sons to some degree, so my hope is that Bush has got a little more than he seems to have." Mailer has an unconventional view of which presidential candidate will benefit the most from their nationally televised debates. "It seems to me that Gore will wipe the floor with Bush, and Bush will end up with more votes as a result," he said. "Gore's still got that unhappy business of being the smartest kid in class, and people don't like that. Politically speaking, being an intellectual is a disadvantage. Which is why (President) Clinton hides it so carefully, even though his mind is a powerful machine." He wonders if Gore might risk filling out the Democratic ticket with "an exciting, dynamic, handsome man, better looking than George Bush, and a man who can charm everyone in sight, men and women alike." Then again, "it's very dangerous if a man's elected president and the vice president's more attractive than he is . . . So Gore probably won't go for that attractive of a vice president. Bill Clinton didn't." Mailer, who unsuccessfully ran for mayor of New York in 1969, said he has "been voting with a heavy heart for many years now." Were he still a New Yorker, he'd "probably obey (Democratic) party allegiances" and reluctantly support Hillary Rodham Clinton in that state's U.S. Senate race. "Hillary is too programmed and politically correct for my taste," he said. "For that reason, I don't get a good feeling when I think of her . . . She just never surprises you with what she says, and that's no good over the long run. Political correctness is never free of the taint of totalitarianism. "I don't mean that she would then become a fascist or anything of that sort," he said. "But it just seems to me that her instincts might not be all one would want in certain sorts of tricky crises." Surely the conventions will miss Norman Mailer.